This is a long overdue review, I went on vacation right after these products were handed to me and I thought it would be too taxing doing beauty rituals whilst negotiating life in a bus, in a plane and in unfamiliar places. I came back about three weeks ago and started this regimen. My thought is that reviews of products of this sort can’t be rushed, this needs time to see whether it really deliver its promise. To be honest I never heard about this product until a blogging friend posted it on her Facebook wall. Eventually I was invited to an event that introduced us this and was given this ULTRA WHITE FACIAL SET to try. I’m a middle-aged mother of three and since anti-aging and whitening creams have come to my consciousness (minus the politics of it), I’ve been jumping from one jar to another finding the right match for my skin. So, I thought I’ll give this set a try. In essence, toners work to rebalance your skin’s pH level after you washed it, it also closes the pores in your skin so that the moisturizer you pat in wouldn’t clog it, sometimes we skip this routine because we’re just too lazy to do it, (feeling guilty right here, I do skip this with my previous regimen) and if we pass over this, most often than not the moisturizer residue will set-in in our open pore and in time white heads will start building-up and worst - break out. I came home from vacation with several unsightly little bumpy pimples; blame it to dust, late night-outs and irregular deep cleansing. I let go the idea of going to the derma because they’ll just strafe it all together and it’ll irritate it more, I right away thought I had this toner and got into the ritual. First thing very notable is that it has a refreshing fruity smell and a yellow liquid, believe me, in just three days of night and day religious application, my pimples gone dry leaving no trace of pimple marks at all, the fruit distillate alcohol contained in this bottle really did a good job. It has a mild formulation and that throughout the time I was using it I didn’t notice any horrid peel offs or unsightly sheddings at all, only that it stings – but we were warned about this during the product presentation – so the solution: just have a fan handy. I also love the deep cleansing ability of this toner, I use a 10x magnifying mirror to test whether it can really strip off shallow rooted white heads and the result is pleasing. In just three weeks, it lived up to its promise, it radiantly brightens my skin, my pimple marks were gone, it softens my patchy discolorations and it makes my pores noticeably less noticeable. This toner contains no Parabens and Hydroquinone so you don’t have to worry about endangering your skin’s health whilst beautifying and whitening. -packaging. Maybe a more elegant bottle in the future. Skin Science says that our skin cells’ clock gene works efficiently well during the time we’re asleep at night, it naturally renew and replenish our skin’s lipids. Night Serum works to help stimulate skin cellular renewal. I deem this theory very valid, hence, my fascination with night serums, sometimes I don’t even use moisturizer - just this. I’m using a Korean brand prior to testing My Skin Essentials’ Ultra Night Serum and I must say the latter is lighter and ultimately non-greasy. 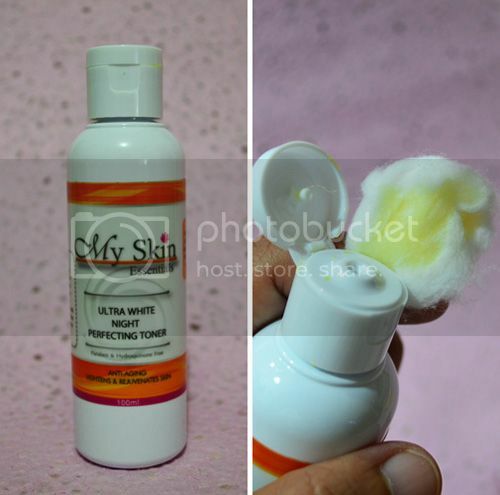 As you can see the liquid is translucent and light in consistency, this makes it very easy to gently skim the serum onto your skin, leave it few minutes more and you can feel your skin gets plumper and suppler. The morning feel is even nicer – firmer, tighter skin. 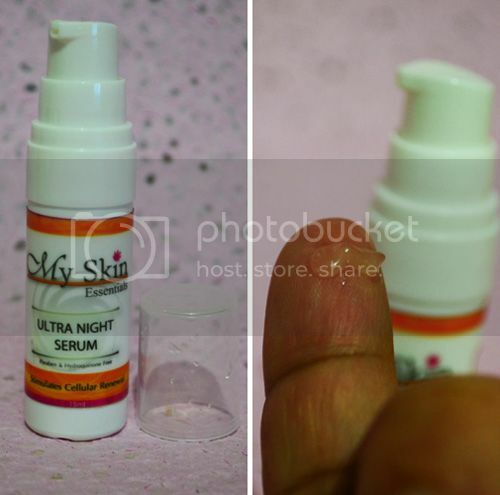 -I’m a great fan of night serums and 15ml is just too small a bottle for me. -again, packaging, maybe a more elegant bottle in the future. This cream comes in French rose, I don’t know if I described the color right, but it’s definitely in a family of pink. Again, the very noticeable strength of this cream is its fruity scent. A pea sized cream can already cover your whole face. I really like creams that are not heavy and sticky and this one is just perfect. It get’s absorbed immediately without slimy residue left on your skin, I so like the after-effect feel – my skin feels supple, powdery and velvety. If you’re in a rush catching up your day, topping it up with your staple compact will already do. The cream is already packed with SPF 45 so don’t have to use another cream for sun cover. I probably have tried all the creams there are carried by Watsons, not to mention Japanese and Korean creams that are so accessible these days and I’ve maintained a jar or two that I can say a match with my skin type, My Skin Essentials’ Ultra white day cream is a very welcome addition. Thanks to my genes, I’m blessed with a not so sensitive skin, but I’m so prone to milia and my most hated –breakout, believe me, this cream is a gem as it's non pore clogging and has slowly stripped off my discolorations. Speaking from personal experience, three days of successive use of a certain facial cream is actually enough to let you see little lumps forming underneath your skin if and when the cream doesn’t suit your skin type. But with My Skin Essentials’ Ultra white day cream, three weeks is already a long time to have me skipped visiting my derma, very remarkable. The night cream comes in ivoryish color. Unlike her sister ‘day cream’ that is lighter in terms of consistency, the night cream is creamier, but what is so surprising is that as you gently work with the cream on your face it gets absorb immediately, leave it like few minutes more and you can already go to bed without worries of smudging your pillow. The tight and supple after-feel is what I really like, amazing! The fact that this cream does its job so well and on top of that does not clog my pores is an ultimate yes for me. What I don’t like about the two creams? -again, the packaging. It would be much convenient if it’s placed in an easy-squeezy tube, also for hygienic purposes. Sometimes when the jar goes upside-down in my bag, the cream messes up the brim, it comes with a jar top cover though, but thing is the cream gums the cover and I don’t like it. Anyway, in all honesty, the product itself is perfectly fantastic it’s actually enough to say – who cares about the package. And what I like about the two creams? I’m happy I’ve tried their product. It’s made of natural ingredients that truly deliver its promise. It does not contain Parabens and Hydroquinone that are known to cause harm to humans. Using this set in proper and religious manner will definitely leave your skin brighter, radiant, firmer and healthier. Will I buy this again? Definitely! Will I recommend this? Absolutely! As a matter of fact, I’m giving away a set of ULTRA WHITE FACIAL SET for you to try. Good Luck ladies and get prettified naturally. Nag join nako unta makadaug. Ganahan jud ko sa Ultra White Facial set ma'am as in very effective.